Tales of Graces, the 12th instalment in the Tales series from Namco gives itself away in its tagline: much of the story can be deduced from the five-word summary of the game on the rear of its case of “bonds of friendship are eternal.” Given that the game is a JRPG (given the box art, it would be completely unreasonable to assume anything otherwise), one can adduce that the narrative of the game will be premised around a length exposition of the theme of friendship, with much self-sacrifice to be expected in the quest for the realisation of a true friendship. The genre, Final Fantasy being perhaps the worst offender, does have a habit for lacking subtlety in its themes: here, it is that of friendship, in Final Fantasy VIII the theme was that of attempting to turn the protagonist’s frown upside down. Tales of Graces, much to its benefit, plays on the tropes of the genre while doing enough differently to provide a refreshing experience. Much attention is paid to characterisation in the game, with even the post-battle screens being used to this end. While the theme is immediately apparent, Tales of Graces does, however, in contrast to its contemporaries, manage to do something sensible with the overarching theme rather than having its narrative be nothing but a slave to it: the game is not just about a group of friends, but it is about the very capacity of man to withdraw from his own concerns for the benefits of others on the macro scale and the nature of intrapersonal dynamics between genders and intergenerationally on a more micro level. The reason Tales of Graces so easily goes beyond what should be a sure-fire descent into a narrowly focussed series of game events that demonstrate just how much everyone is everyone else’s chum in spite of whatever great adversity may befall the group is a simple one: the wonderfully deep characterisation of the six major players of the cast. 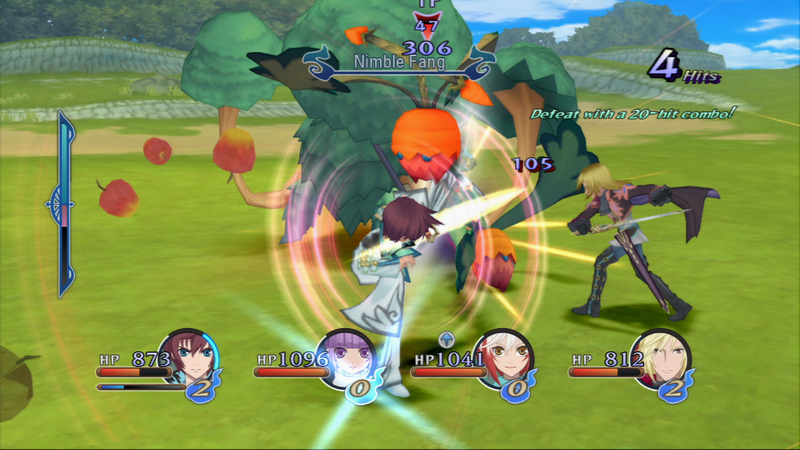 Due to the fact that the player is constantly reminded how disparate a group it actually is, and how divergent their reasons for being involved in the key protagonist’s, Asbel, quest, the player is never given a chance to think of any of the characters as faceless surrogates: they all have their purposes in both the story and the gameplay, and all have their own fairly selfish reasons for continuing on. A traditionally characterless and cold part of the JRPG experience, the post-battle rewards screen, is converted into a podium for at least one character to express themselves, whether this be admonishing a poor performance or congratulating the group: the dedication of the development team to creating an immersive game world through its characters is perhaps demonstrated better by this repurposing of an extant gameplay mechanic than anything else – no opportunity is missed. Instrumental in the creation of this level of characterisation and its associated player investment in the characters is the use of a device that very few games do in narrative: the game starts with the characters as inquisitive children, merely investigating their surroundings against the wishes of overbearing parents, rather than simply thrust into a life-or-death situation. The character genesis moment of being in danger occurs completely by accident and as a result of them seeking to visit an old friend. Given that the player follows the core characters from childhood into their teenage years and then adulthood, it would take the stoniest of hearts not to be moved by the experiences of the young cast and feel with them during moments of character transformation borne of moments of peril. Combat is a smooth and rewarding experience. The game is by no means the prettiest available on the PS3, but that is not something that should count to its detriment: this is more than made up for in the depth of the game world, with many people to talk to, side quests to find and enemies with whom to do battle. As is to be expected from a game in this genre, there is a lot of statistic-watching to be done, with attributes of player party characters to be looked after as well as the attribute weaknesses of the many types of enemies. The attributes of player characters are determined first by character level (a function of EXP awarded to the party as a result of combat) and then by the equipped “Title” of any character, with a title being a set of five abilities, some only available when the title is equipped and others given to the character directly. These five abilities per Title are unlocked sequentially with the award of SP from battles, completion of side quests or the use of certain items in-game. The effect of the equipping of one Title over another, however, is marginal: it is possible, due to the nature of some of the Titles in awarding bonuses to characters independent of the Title actually equipped, to get the through the game with little attention paid to the Titles equipped, just ensuring that they are being levelled up. Doing so may well undermine much of the micromanagement enjoyment to be gained from the game, but this seeming concession to less invested players may well put off those more likely to pore over statistics in order to produce the best possible party formation for any given enemy encounter. The combat itself is a fairly simple affair, occurring in real time, save for changing of equipment, use of items and other menu-related tasks. The player controls one character from the party (a choice which can be changed during combat) and can set the strategy of the AI controlled characters to a remarkably fine level of detail. Attacks are categorised into two types: “A-Artes” and “B-Artes”, the former undertaken by the use of X with the left analogue stick, with repeated presses producing higher-damage attacks, should there be sufficient CC (a sort of action point system) remaining for the character to continue the string of attacks; the latter through the use of Circle and the left analogue stick, with these taking a more elemental focus. Square is used for raising the player character’s guard, and dodging in combination with the left analogue stick. The importance of defence and the real-time nature of combat leads to the game resisting another staple of the JRPG genre: the necessity to grind to gain levels (either for characters or Titles) is somewhat mitigated by the allowance for player skill in dodging and weave to level the playing field against more powerful enemies. This seemingly simple system is shockingly rewarding once the player gains a control of it, with much possible from a seemingly three-button system. 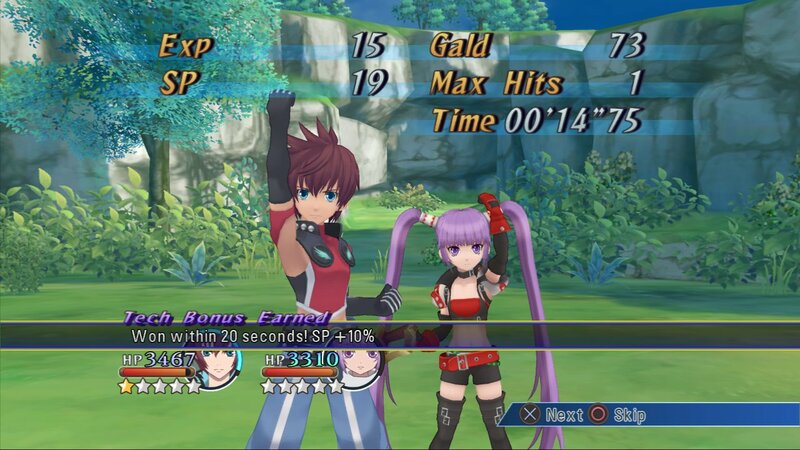 Tales of Graces f is definitely worth the thirty or so hours that it takes to play through the main storyline. In spite of some issues with its difficulty curve and bizarre obsession with throwing several bosses at the player in each dungeon, it provides a compelling story and hopeful narrative that, while naive, is incredibly endearing. The sheer volume of things to see and do also plays in its favour, as well as a rewarding combat system that always works with the player, and rarely against them. Some incredibly bad dubbing work cannot speak a single word against the brilliance of this title.